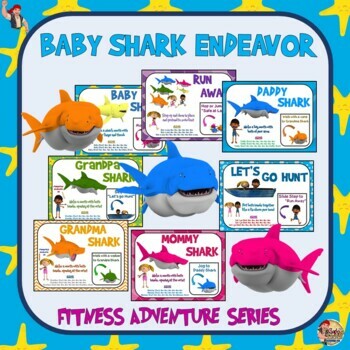 The Fitness Adventure Series- Baby Shark Endeavor is high energy, fun and organized, PE Bay Shark-themed activity that can easily be used as a warm up, cool down, or instant activity. 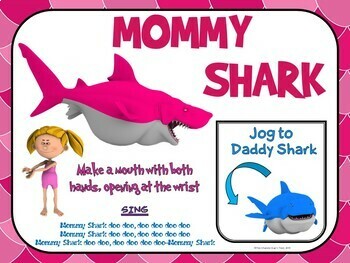 Students move around the playing area from sign to sign, reading and carrying out the indicated Baby Shark SONG VERSE and designated MOVEMENT and then performing a locomotor movement to the next sign. Each sign has a Baby Shark song character or “verse action” with a name, a movement to perform and an exit box that indicates the locomotor movement to perform to the next Baby Shark destination to travel to. A true ADVENTURE!!! 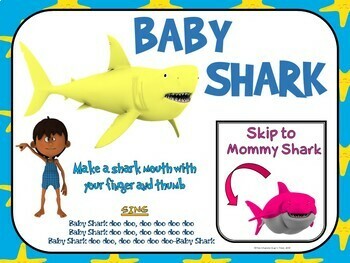 There are 9 Baby Shark Endeavor ADVENTURE signs with a different character/verse action on each one. The signs are “student friendly” providing the verse lyrics and the accompanying gesture with easy to follow directions. The backgrounds give an authentic “ocean feel” to the set and help immerse students in the activity. Students can easily perform the movements with limited instruction and teachers are free to move around to monitor their classes. The movements are developmentally appropriate for elementary school students and can be used in small or large spaces with little modification. Classes will want to repeat the Fitness Adventure Series many times and it will become one of their “favorites” in no time. This fitness activity can be used in a gym setting, in a classroom or anywhere that you have some space to let kids perform some stationary movement and locomotor skills. The Fitness Adventure Series- Baby Shark Endeavor is very easy to set up and can last anywhere from 10 to 15 minutes, depending upon the size of your playing area. The Fitness Adventure Series was designed for Kindergarten through 6th grade students. •	Please go to your My Purchases page (you may need to login). Beside each purchase you'll see a Provide Feedback button. Simply click it and you will be taken to a page where you can give a quick rating and leave a short comment for the product. Each time you give feedback, TPT gives you feedback credits that you use to lower the cost of your future purchases. I value your feedback greatly as it helps me determine which products are most valuable for your gym or classroom so I can create more for you.